Accurate - Intelligent - Reliable - Smart energy metering . 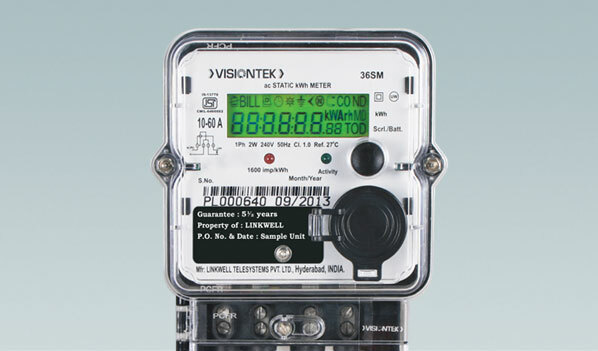 VISIONTEK 36SM single phase static electronic energy meter is designed to meter residential and small commercial energy consumers in distribution networks. The meter is designed to offer reliable energy measurement in single phase circuit and is highly suitable for metering and remote communication purposes. It comes with large display with a range of communication options for local and remote monitoring. The meter complies with national and international metering standards. It is a perfect combination of well-proven metering technology and state of the art communication modems all integrated in single enclosure. © 2019 VISIONTEK, Linkwell Telesystems Pvt. Ltd. All rights reserved. VISIONTEK core expertise in various telecommunication technologies - Fixedline - PSTN, Ethernet, Wireless - CDMA, GSM and Wi-Fi.